There are nights, I have to admit, when I don’t feel much like stirring for the 25 or so minutes it takes to make a risotto… then I open a bottle of wine, get into the rhythm and am thoroughly mellow by the time I spoon it into my favourite flat soup plates. Cut the sausage into chunks, about the size of a walnut, then roll them slightly into little balls. Heat the olive oil in a heavy pan, add the sausage and sauté until well browned. Add the onion and cook until just softening. Tip in the garlic and cook for 1 minute, then add the rice and stir it round to get it coated in the juices. Heat both the wine and the stock separately to simmering point and keep them simmering. Add the wine a little at a time, stirring continuously and adding more only once the previous lot has been absorbed. Now add the stock a ladleful at a time, stirring continuously. It will take about 25 minutes to add all the liquid. 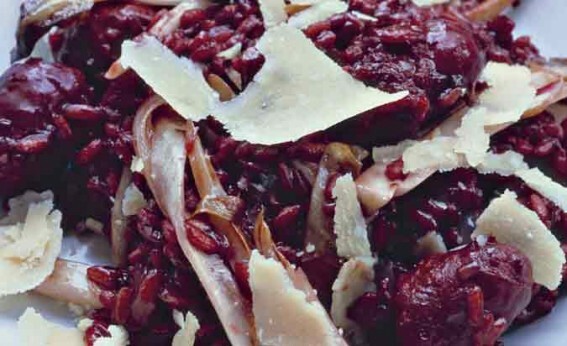 About 10 minutes before the end of cooking time, stir in the radicchio. It will wilt in the heat. Taste for seasoning; both the wine and reduced stock are salty, so see how much salt you need to add. Season with pepper, too. Stir in the butter and the cheese and serve immediately, with extra Parmesan on the side.